This example shows a detailed model of a 100-kW array connected to a 25-kV grid via a DC-DC boost converter and a three-phase three-level VSC. 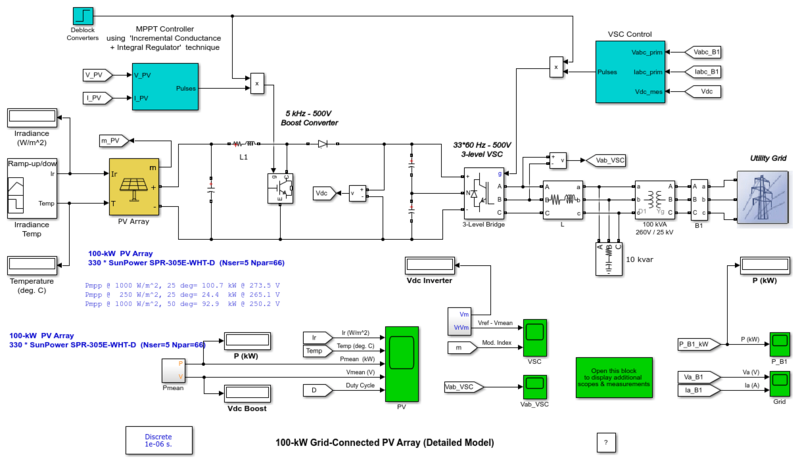 A 100-kW PV array is connected to a 25-kV grid via a DC-DC boost converter and a three-phase three-level Voltage Source Converter (VSC). 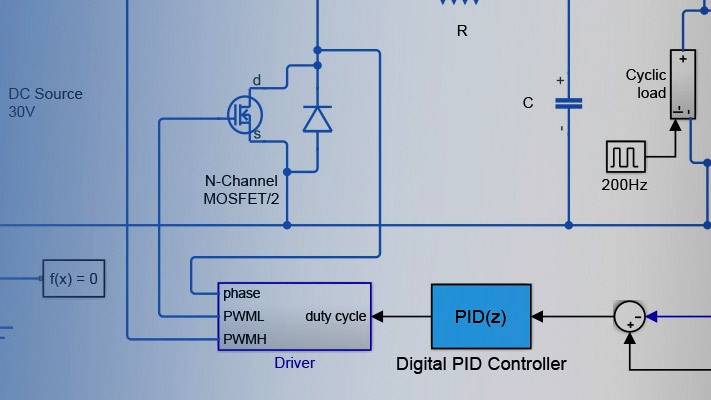 Maximum Power Point Tracking (MPPT) is implemented in the boost converter by means of a Simulink® model using the 'Incremental Conductance + Integral Regulator' technique. Another example (see power_PVarray_grid_avg model) uses average models for the DC_DC and VSC converters. In this average model the MPPT controller is based on the 'Perturb and Observe' technique. PV array delivering a maximum of 100 kW at 1000 W/m^2 sun irradiance. 5-kHz DC-DC boost converter increasing voltage from PV natural voltage (273 V DC at maximum power) to 500 V DC. Switching duty cycle is optimized by a MPPT controller that uses the 'Incremental Conductance + Integral Regulator' technique. This MPPT system automatically varies the duty cycle in order to generate the required voltage to extract maximum power. 1980-Hz 3-level 3-phase VSC. The VSC converts the 500 V DC link voltage to 260 V AC and keeps unity power factor. The VSC control system uses two control loops: an external control loop which regulates DC link voltage to +/- 250 V and an internal control loop which regulates Id and Iq grid currents (active and reactive current components). Id current reference is the output of the DC voltage external controller. Iq current reference is set to zero in order to maintain unity power factor. Vd and Vq voltage outputs of the current controller are converted to three modulating signals Uabc_ref used by the PWM Generator. The control system uses a sample time of 100 microseconds for voltage and current controllers as well as for the PLL synchronization unit. Pulse generators of Boost and VSC converters use a fast sample time of 1 microsecond in order to get an appropriate resolution of PWM waveforms. 10-kvar capacitor bank filtering harmonics produced by VSC. 100-kVA 260V/25kV three-phase coupling transformer. Utility grid (25-kV distribution feeder + 120 kV equivalent transmission system). The 100-kW PV array uses 330 SunPower modules (SPR-305E-WHT-D). The array consists of 66 strings of 5 series-connected modules connected in parallel (66*5*305.2 W= 100.7 kW). The 'Module' parameter of the PV Array block allows you to choose among various array types of the NREL System Advisor Model (https://sam.nrel.gov/). The PV array block menu allows you to plot the I-V and P-V characteristics for one module and for the whole array. The PV array block has two inputs that allow you varying sun irradiance (input 1 in W/m^2) and temperature (input 2 in deg. C). The irradiance and temperature profiles are defined by a Signal Builder block which is connected to the PV array inputs. Run the model and observe the following sequence of events on Scopes. Simulation starts with standard test conditions (25 deg. C, 1000 W/m^2). From t=0 sec to t= 0.05 sec, pulses to Boost and VSC converters are blocked. PV voltage corresponds to open-circuit voltage (Nser*Voc=5*64.2=321 V, see Vmean trace on PV scope). The three-level bridge operates as a diode rectifier and DC link capacitors are charged above 500 V (see Vmean trace on VSC scope ). At t=0.05 sec, Boost and VSC converters are de-blocked. DC link voltage is regulated at Vdc=500V. Duty cycle of boost converter is fixed (D= 0.5 as shown on PV scope). Steady state is reached at t=0.25 sec. Resulting PV voltage is therefore V_PV = (1-D)*Vdc= (1-0.5)*500=250 V (see Vmean trace on PV scope). The PV array output power is 96 kW (see Pmean trace on PV scope) whereas specified maximum power with a 1000 W/m^2 irradiance is 100.7 kW. Observe on Scope Grid that phase A voltage and current at 25 kV bus are in phase (unity power factor). At t=0.4 sec MPPT is enabled. The MPPT regulator starts regulating PV voltage by varying duty cycle in order to extract maximum power. Maximum power (100.4 kW) is obtained when duty cycle is D=0.454. At t=0.6 sec, PV array mean voltage =274 V as expected from PV module specifications (Nser*Vmp=5*54.7= 273.5 V). From t=0.6 sec to t=1.1 sec, sun irradiance is ramped down from 1000 W/m^2 to 250 W/m^2. MPPT continues tracking maximum power. At t=1.2 sec when irradiance has decreased to 250 W/m^2, duty cycle is D=0.461. Corresponding PV voltage and power are Vmean= 268 V and Pmean=24.3 kW. Note that the MMPT continues tracking maximum power during this fast irradiance change. From t=1.2 sec to t=2.5 sec sun irradiance is restored back to 1000 W/m^2 and then temperature is increased to 50 deg. C. in order to observe impact of temperature increase. Note that when temperature increases from 25 deg. C to 50 deg. C, the array output power decreases from 100.7 kW to 93 kW. Moacyr A. G. de Brito, Leonardo P. Sampaio, Luigi G. Jr., Guilherme A. e Melo, Carlos A. Canesin "Comparative Analysis of MPPT Techniques for PV Applications", 2011 International Conference on Clean Electrical Power (ICCEP). The module characteristics were extracted from NREL System Advisor Model (https://sam.nrel.gov/).